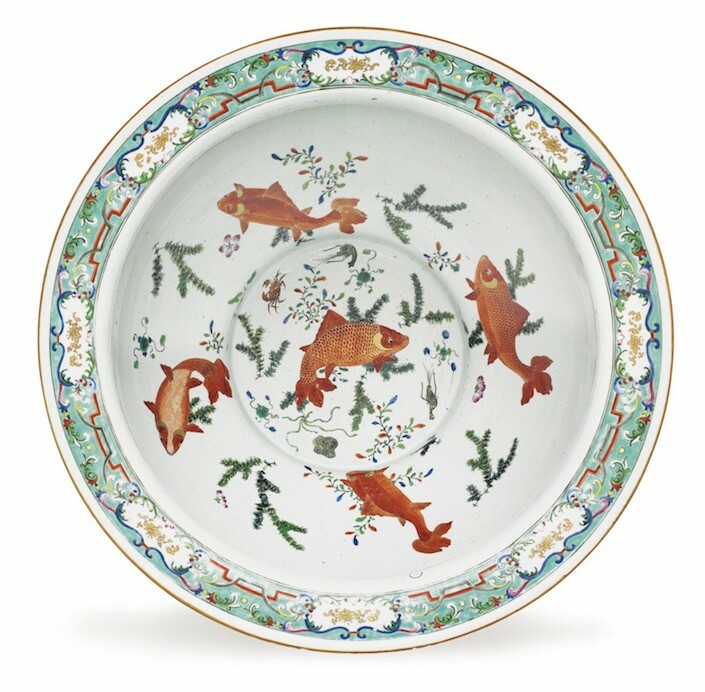 Not only is Chinese Export porcelain a visual feast but a fascinating lesson in the cross cultural exchange of art, ideas and commerce. 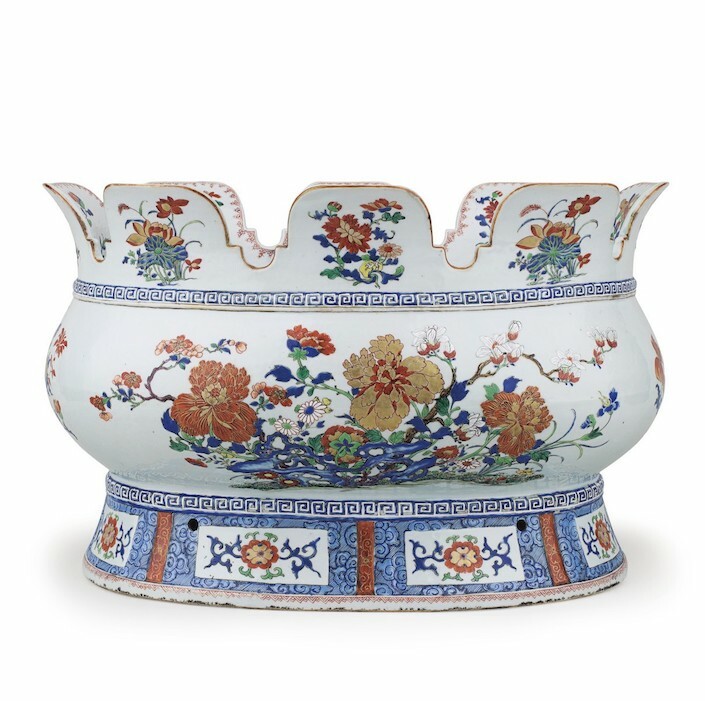 Catering to western demand, this “china” (which is of course how the word originated) is an amazing melding of Chinese artisanship with Western themes, forms and decorations. Earlier this week, I stopped by Christie’s in New York to take a peek at the wonderful Chinese Export Art sale that goes on the block Thursday. 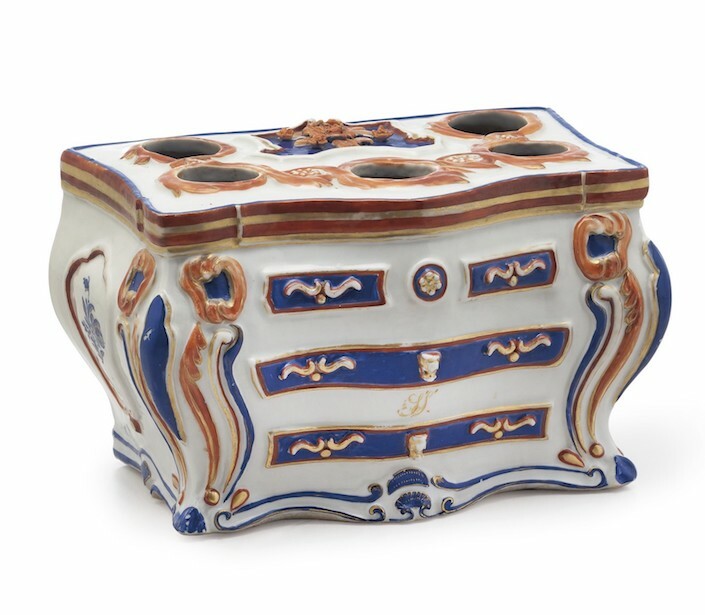 A thank you to Carleigh Queenth, Christies VP, Specialist Head, European Ceramics and Glass who did a fun video walk through with me (hang in – it’s a slow start). And be sure to follow her very entertaining instagram feed (@breakingisbad ). One of the most interesting aspects of China Export are the stories these pieces tell. 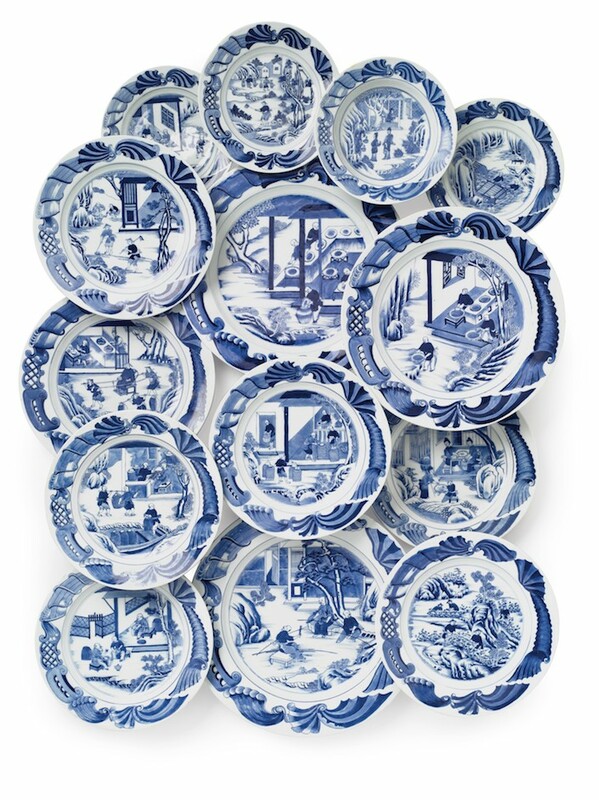 A standout in the sale is this very rare set of blue and white ‘Tea Cultivation’ dishes circa 1750. While we are now so accustomed to global connections, westerners in the 18th were fascinated by the exotic traditions of the East, including the introduction of tea. The 17 plates above each depict, within a decorative rocaille border, detail above, a different stage of tea making, from growing and harvesting to selling and shipping. In a variety of sizes, the largest is 15-1/8″. 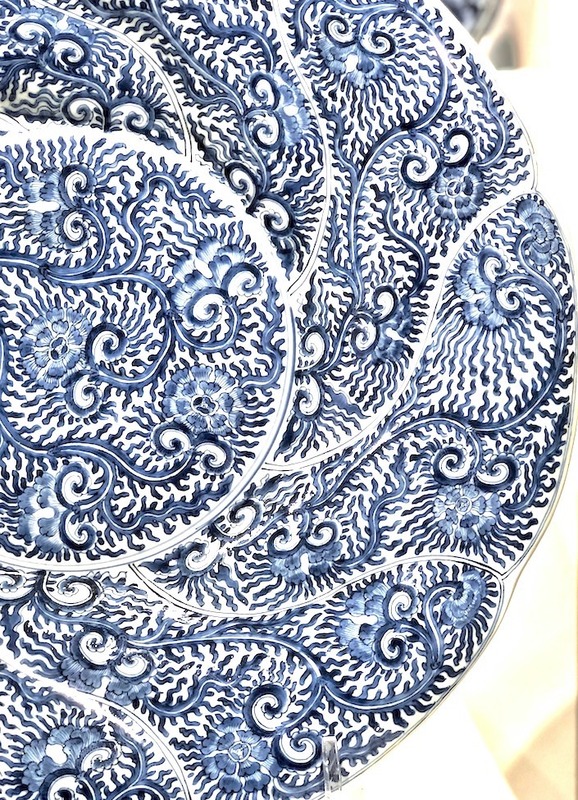 Another exceptional blue and white offering is a large (20″) pair of scrolling peony patterned dishes, above and detail belo.. What is especially unusual is the unusual molded shape. You can see more of these, including their beautiful painted undersides in the video. 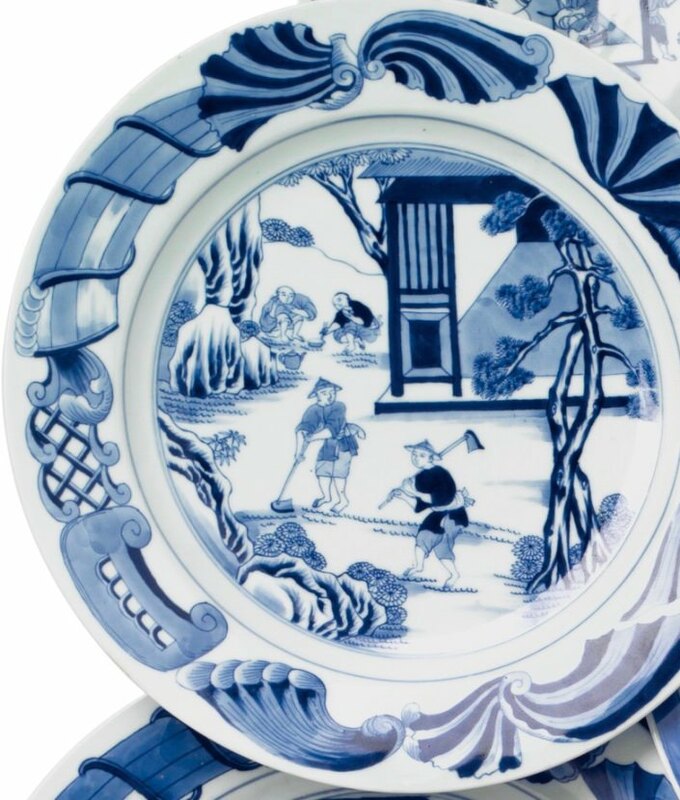 Of course not all Chinese Export is blue and white, nor merely dishes and vasess. The Chinese have a long tradition of making porcelain animals. This rare pair, one of only three known of deer water-droppers and covers (used to mix with ink) are possibly a set listed in the 1688 inventory at Burghley House, England. 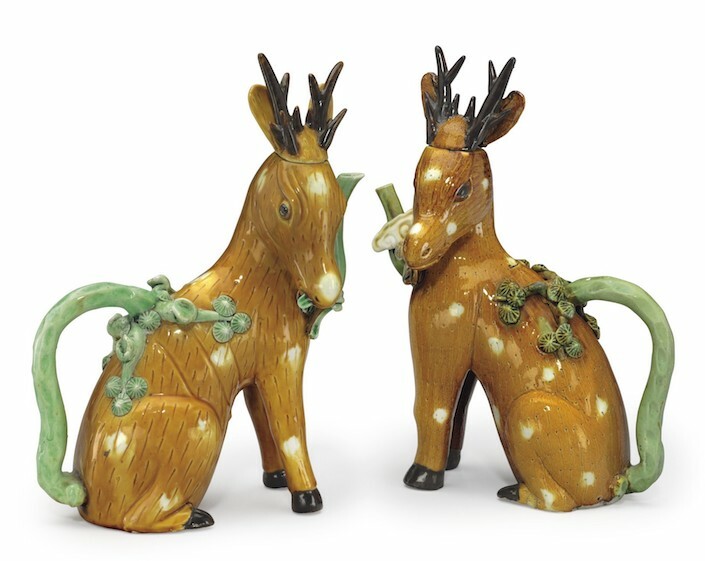 Representing longevity, the spotted deer, are doubly lucky as they hold the sacred lingzhi fungus, a mushroom often used in Chinese art representing immortality, in their mouths. It was believed that deer could find lingzhi in the same way that pigs hunt truffles. 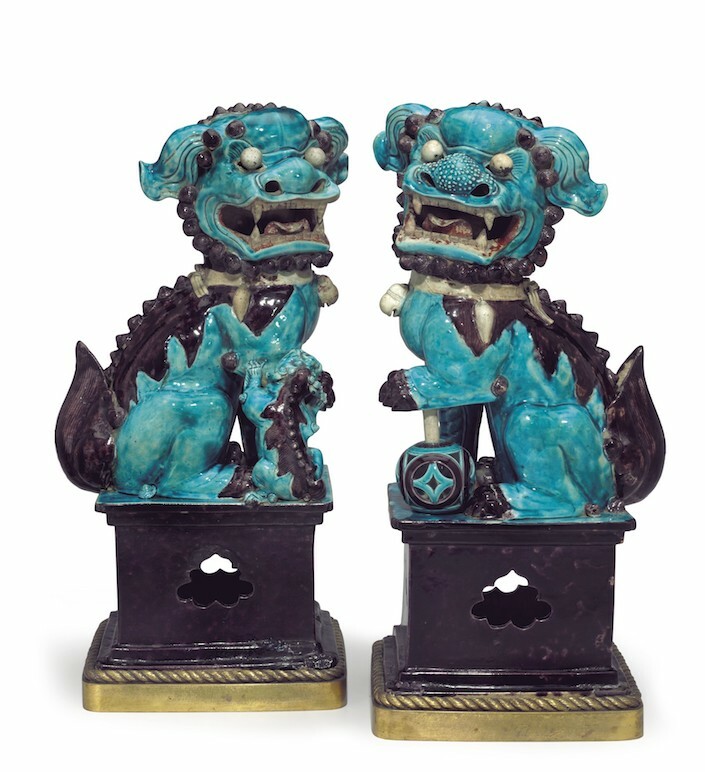 While we may generically call all imitations of these chinoiserie style objets foo dogs, this fantastic pair are actually Buddhist Lions. In brilliant turquoise and purple glazes, they stand at a stately 18-3/4″ tall. 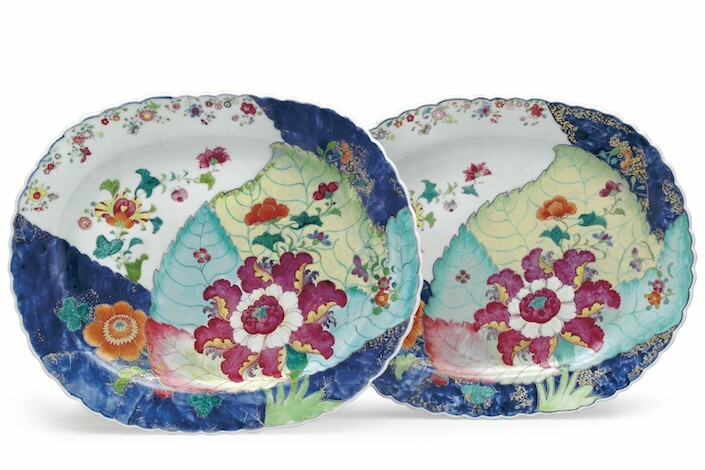 Many of the classic Chinese Export patterns have been reproduced over the years, especially by Mottahedeh, known for the authentic reproductions based on museum and historic foundation originals. One of the most popular has to be the colorful Tobacco Leaf. And in the sale are several beautiful original examples, including a pair of two large platters from 1775. And I actually own dessert/salad plates Mottahedeh’s Sacred Bird and Butterfly that you have occasionally seen when I post tabletop images. 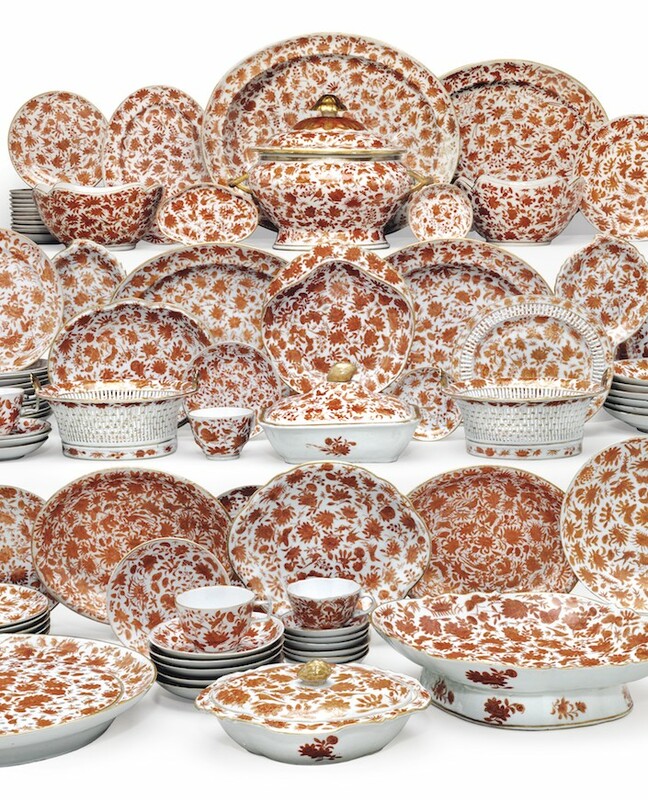 A large and amazing original set with fabulous serving pieces is featured in the sale, below. It’s a great saturated yet neutral color that would be so fabulous to mix and match with other patterns and colors – don’t forget Alex Papachristidis’ advice about purple! This enormous and highly decorative bowl is referred to as a monteith. At this size (20-1/4″ wide) it would have been for chilling bottles of wine. Smaller versions were intended to chill glasses, whose stems could sit in the notches on the rim. The crenellated edging is what gives it its name, after Lord Monteith, the eccentric Scot who wore his cloak hem with this ornate design. Another monumental offering is this stunning famille rose fish bowl, with birds, peonies, rocks and fish embellishing the design. The inside shows carp and shellfish swimming among plantlife. Armorial plates are a favorite of mine. I love their graphic appeal and the attending history. While famille rose can sometimes be a tad too sweet for me, this pair of gutsy scalloped rim plates are sensational. 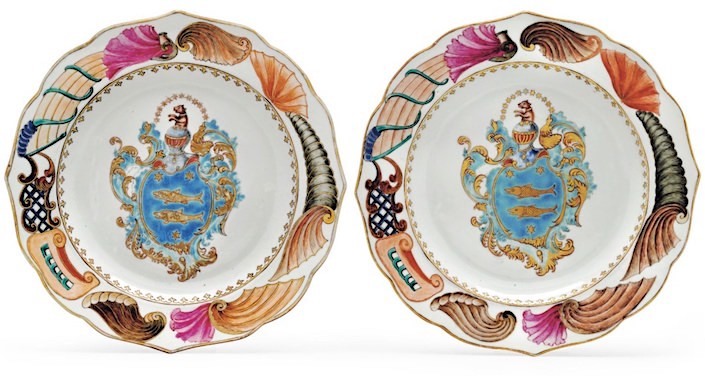 Enameled with the arms of Snoek of Amsterdam, the cavetto features a gilt spearhead band with a colorful rocaille shell border. Lastly, a fun piece is this bough pot (a vessel for flowers). 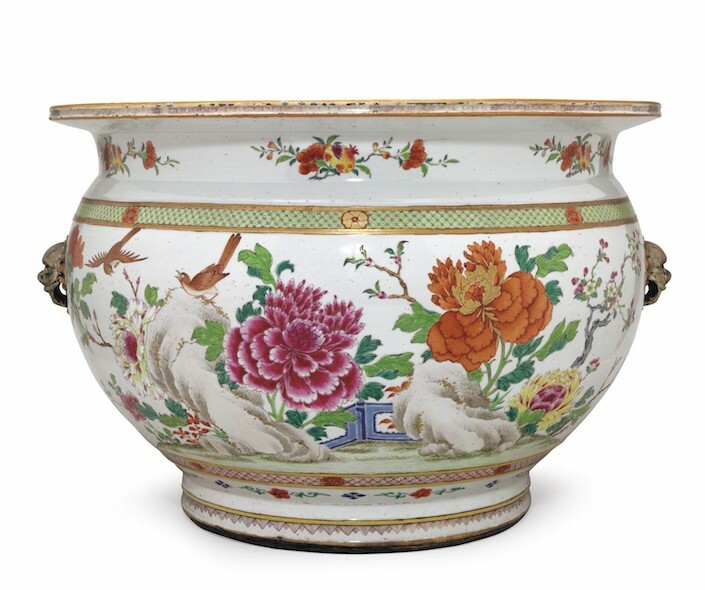 Shaped like a curvy European commode, it clearly shows the influence of western style on Chinese Export. Do check out the fun video and sale online – there are many exquisite offerings and for you collectors out there, happy bidding! all photos courtesy of Christie’s except the detail of the peony plate which I took. This entry posted in art, auctions, Christie's, interior design. Entry Tags: auction, Ceramics, Chinese Export, Christie's, Collecting, Porcelain Bookmark the permalink. That large set … words fail but hosting imagination runs wild. What a sensation. Thanks for the luxurious lesson. Really enjoyed the video walk through so informative and interesting! Suggestion; when taking video with your iPhone turn it horizontally, you will maximize the resolution and coverage. Keep the beautiful videos coming! Thank you Maryalice – glad you enjoyed. These casual vertical videos on Facebook, shot on my phone, are originally from Instagram stories where that is the format. For the “real” video series, which I hope you’ve seen, the videos are all in the more professional horizontal format, shot with a real camera. Beautiful pieces I especially love the peony plates, and just imagine that border on the first set alone on a white plate- modern really. 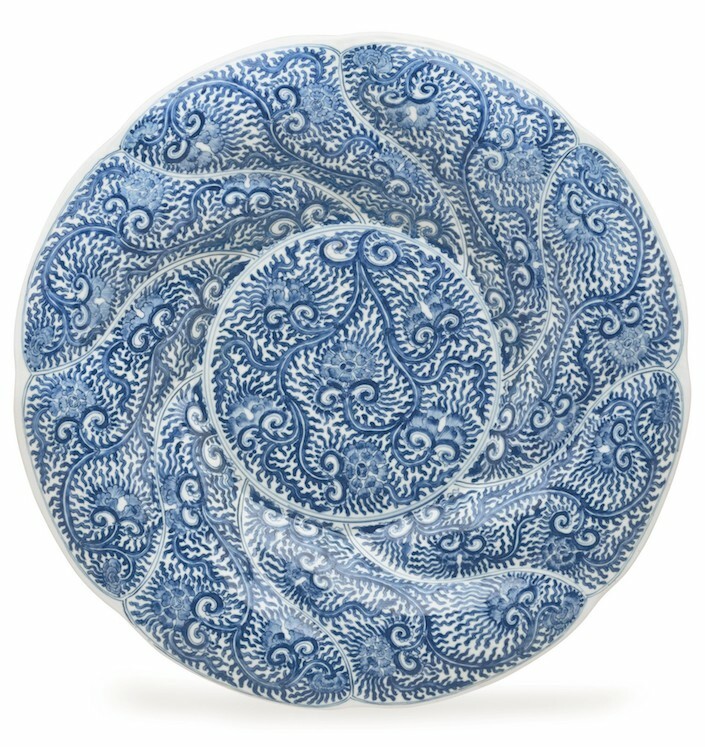 I’ve been working with pieces from Marjorie Merriweather Post’s Hillwood Chinese Export Porcelain-hers is quite delicate though the center is a coat of arms. The entire story of CEP is fascinating. 82 queries in 0.505 seconds.